Ever wonder how much time and effort goes into creating the perfect voice over and how to record them yourself? As most of us hear the voices on the screen we rarely think about the person who has recorded it or the professional level of technique used to create it. So firstly let's explore where you can create a voiceover. It can be in your living room, bedroom, office or even garden shed. First off, you should take the acoustics of each area into account - you don't want echo or room reverb present in your recording. Even if you want to sound like you're recording in a church, it's best to add this in as an effect after the recording. One aspect to remember when recording is what sounds you can hear when in absolute silence. Is there air coming from the air con or windows? Or the tick tocking of the clock hanging on your living room wall? If this is a 'yes' you most definitely need to plan, prepare and organise the best way of eliminating these sounds before you start recording. Investing in large acoustic panels or blankets is a must if you're planning on recording plenty of voice overs. With the accessibility of having your own recording equipment to use at home, the capability of recording professional voice overs without the need to travel to a professional studio is as easy as ever. Assuming recording voice over is easy is an understatement as there are numerous ways to ruin a voice over and poor understanding of how to record is an increasingly common issue faced by many. So what can your production company do to make sure the voice over artist is going to sound the best for your required audience? A key thing to remember is to make sure you have your voice over artist record multiple versions of what it is you're asking them to record. For example you wouldn't want a serious documentary having a light in tone voice over. So the more versions of the script you have given your voice over artist the better in the long run for the editing process at the end. So what equipment do you need to record a voice over? Gone are the days of needing a full mixing desk and studio to pull in the perfect vocals. 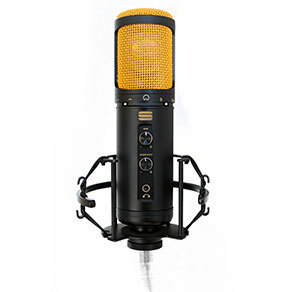 There are many broadcast grade USB condenser microphones on the market such as the StudioSeries SL150 from EditorsKeys.com which costs under GBP100. A USB Studio microphone means you can plug in your microphone and use it directly within software such as Final Cut Pro X, Adobe Premiere Pro or Grass Valley EDIUS by simply selecting the USB microphone as your standard input device. Perfect if you're a small production company and don't have expert knowledge with software such as Pro Tools. A pop filter is also an important and often overlooked tool to use when recording. How many voiceovers have you listened to and all you can hear is the microphone suddenly peaking as 'Doohs and Psss sounds hit the microphone, ruining an otherwise perfect voice over? Well a pop filter simply filters and takes out these pops and hisses. Making sure the voice over artist is wearing a good pair of quality closed ear headphones is a must as mistakes or imperfections will be much easier to pick up when live monitoring, rather than recording blind and trying to rectify issues in the edit suite later on. Ever heard of the phrase 'taking a stand'? Well this is very important in many ways with setting up a voice over recording, a piece of script or paper the artist is reading from is going to be a hassle if not perched properly on a sturdy music stand or a book stand, and these cost next to nothing! So make sure your stand is ready waiting to be used on the day of recording. Also you don't want your voice over artist slouching during a recording, this will do nothing for the artists voice and projection. On a side note, make sure that the artist is not wearing any noisy clothes such as tracksuits. This might sound silly but the last thing you want to be doing is spending your time trying to edit out the rustling of a shifting voice over artist. Make sure you're recording at the perfect distance, which is around 15cm from the microphone. If you're not sure on distance, many use the 'thumb and finger' trick. Simply put your thumb up to your mouth and outstretch your thumb and little finger. This distance is usually the ideal distance between you and your microphone. So now you have all the tips and techniques to record, you should be able to avoid all of the common mistakes mentioned above allowing you get something great recorded to impress your clients. For more advice and tips and hints feel free to tweet the team @editorskeys or the team @tvbay and we will be more than happy to help out! Good luck guys and keep focused!